The Ultra Isolation Transformer suppresses common mode noise by introducing a grounded shield between its primary and secondary windings. The grounded shield provides a low impedance path to ground by capacitive coupling which prevents unwanted high frequency signals contained in the source voltage from reaching the transformer secondary. The grounded shield between the primary and secondary windings is called an electrostatic shield. This shield does not perform any function with regard to harmonic current or voltage distortion wave forms. However the shield is extremely valuable in protecting sensitive equipment from common-mode electrical noise and transients generated on the line side of the transformer. 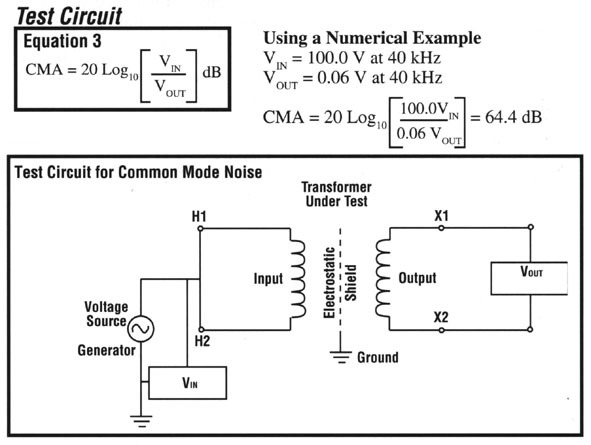 The ratio of the common mode noise on the input to that of the output of the transformer is expressed in decibels as shown in Equation 3. An isolation transformer with an electrostatic shield can have a ratio of input noise voltage (VIN) to output noise voltage (VOUT) of 1000:1 or even higher. The electrostatic shielded transformer attenuates higher frequency noise in the 10 K Hz - 100 K Hz range. 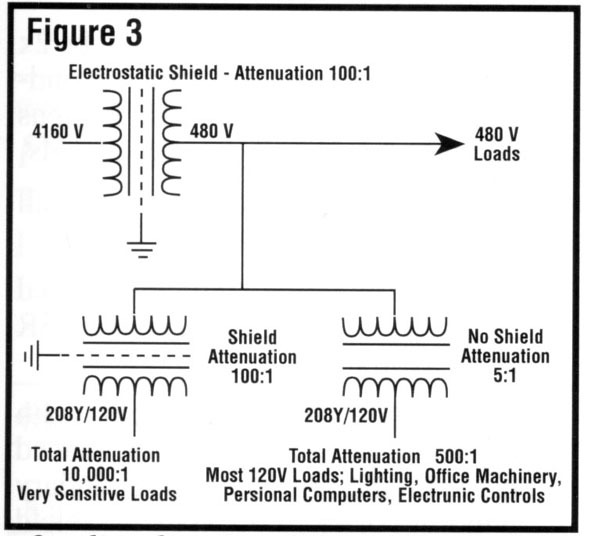 If a shielded transformer feeds another shielded transformer, there is an effect of the attenuation ratio multiplying as shown in Figure 3. If the attenuation ratio is 100:1 in each of the transformers, the total attenuation will be 100x100=10,000:1. Obviously, cascading inherently multiplies the attenuation effectiveness of shielded transformers. The term cascading means that two or more transformers are connected in series on the same system. Line diagram shows system with shielded up line transformer and the attenuation ratios for various combinations with down line transformers.